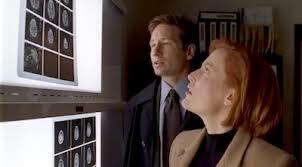 Case: Young kids with super-speed are misbehaving while Mulder and Scully try to get to the bottom of it all. The X-Files took a lot a criticism in the sixth season for being too light, too funny, too soft. As the show ramped up its seventh season, it tried to address this problem and return to its roots, to what had made the show what it is. Did it succeed in this episode? In a word (or two) – sort of. We’re back to a MotW that Mulder and Scully are hunting while exchanging quips. While it is fun to watch an old school episode, and some of the quips are very good, this episode failed on too many levels to be a lot of fun to watch. One of the two fundamental problems of this episode is the writing. The characters are stock and predictable. The sheriff has a son who is the cool kid who is dating the pretty girl who secretly likes the new kid who wants to hang out with the cool kid. It’s been done. The story itself isn’t bad. Teenagers in town have found something that gives them super-speed and are using this power in truly awful ways. There are also some good scenes and some truly gruesome effects. The murder of the teacher is particularly difficult to watch. Once again, however, this episode takes itself and its story too seriously. It tries to do too much and, as a result, does too little. The super-speed is clearly a metaphor for youth and vitality. There are more than a few references to the fact that Mulder and Scully are older than these kids and, therefore, slower. That metaphor may have been enough, but the writers couldn’t help themselves and drew far too many parallels to drug abuse. Speed. Get it? The biggest problem, however, is the acting. At a time when television was filled with young actors who could, more or less, act, these three are terrible. They can barely get the dialogue out without sounding forced and silly. To be fair, some of what they have to say is laughably cliched, but these three can’t seem to get through it in any real way. More than once, I groaned at a line delivery. -- The whole idea of aging could be applied to this show as well. What was once young, fresh, and original is now not so much. -- I noticed the accents this time through. They range from Deep South to Midwest to Philadelphia. Once I noticed them, I couldn’t stop fixating on them. -- The special effects are pretty good. This episode was actually nominated for a special effects Emmy. Final Analysis: This is not a terrible episode, nor it is very good. It is, finally, simply forgettable. ChrisB spends far too much time in front of a screen or with a book in her hand. Season 6 had a lot of great episodes. Season 7, not very many. This one was all bratty teenagers and special effects. Great review -- I agree with your assessment. And Scully really was a Betty... back in the day.